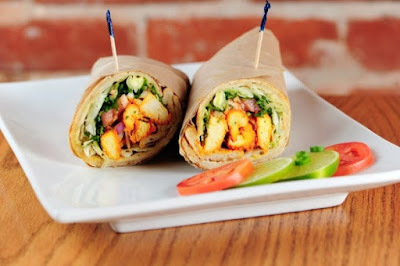 Chicken Tikka Wrap is made with tendered chicken tikka roll, that tossed with onion, pepper and sauces. 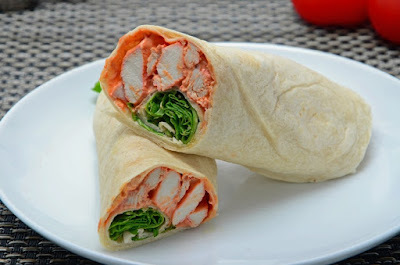 This is one of the most delicious chicken dish in form of wrap or frankie. It serves a great taste because of the blend of unique sauces. Clean the chicken breast in normal running water and chop into small pieces. Combine all the ingredients of filling in a bowl except the oil. Mix the chicken pieces very well to coat evenly, cover the bowl with the wrap paper and keep in the refrigerator for 30-40 minutes. Preheat the oven on 450F degrees and soak the wooden skewers in a bowl of cold water for 5 minutes. Thread the marinated pieces of chicken onto the skewers and keep in the oven to grill for about 8-10 minutes. Keep checking until chicken turns into golden brown in color, also check the tenderness of chicken with the fork or knife. In between spread little bit of oil upon the chicken. When the chicken is done then remove it from the skewers and place in the plate. Place the tortilla on the clean surface and divide the chicken into equal portions. 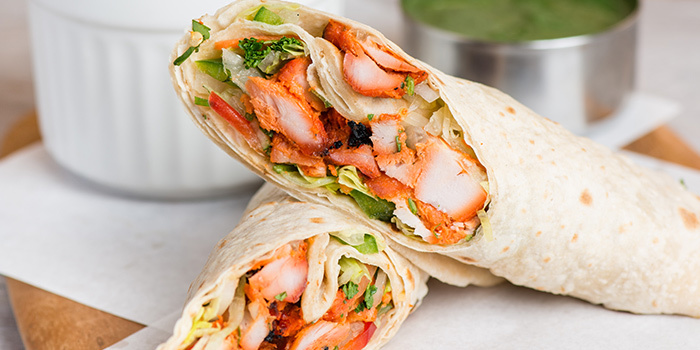 Now spread little butter and sauces right on the center portion of the tortilla, place the chicken, arrange the shredded vegetables and sprinkle some chaat masala. Fold the tortilla from down, left and right side. Fix with the toothpicks and heat for few seconds before serving. You can heat it in the oven or on the hot griddle just for few seconds. You may add veggies like lettuce, broccoli, celery and your favorite veggies to make it more flavorful. Vegetable oil or butter can be used instead of olive oil. You may make this chicken in the non-stick pan as well. Chicken Tikka is One of my favorite After Chicken Dry recipe, Thank you for sharing this recipes with us.